1. question: Will Wipe-Out, Patch-Out, or Tactical Advantage harm a chrome lined barrel ? answer: There are no caustic chemicals in these cleaners that can harm chrome. Also there are no chemicals that can harm nickel plated firearms. 2. question: Can Wipe-Out, Patch-Out, or Tactical Advantage produce rust ? answer: That is a physical impossibility, because these products contain 3 anti-corrosives. TEST: Clean a sample of the metal you want to test with a wire brush or a belt sander , so that the metal is stripped clean. Put some Wipe-Out, Patch-Out, or Tactical Advantage on a clean gun patch and wipe the sample with one of those. Set the sample on your bench and check it every couple of months. You will see that it will go for years with no signs of corrosion. 3. question: Should I put oil in the bore after cleaning with Wipe-Out, Patch-Out, or Tactical Advantage ? The reason we don’t want you to put oil in the barrel is two-fold. When oil burns it produces carbon deposits which are harder to remove than copper fouling. The second reason is that with oil in the bore after cleaning, it is necessary to take 4 to 5 fouling shots. The fouling shots in reality just burn the oil residue out of the bore. Oil in the bore causes the bullet not to get adequate purchase on the rifling. The bullet sort of hydro-planes inaccurately until all the oil is gone. With Wipe-Out you don’t waste 4 or 5 rounds of ammo every time you clean. More importantly the “cold-bore shot” will be right in the middle of the group. 4. Got a great question from Brian Markov. THE DIFFERENCE BETWEEN ‘WIPE OUT’,‘PATCH OUT’,& ‘TACTICAL ADVANTAGE’? ‘WIPE OUT’ was the first foaming bore cleaner; sold since 97. The foam may be applied the the muzzle or the breach. 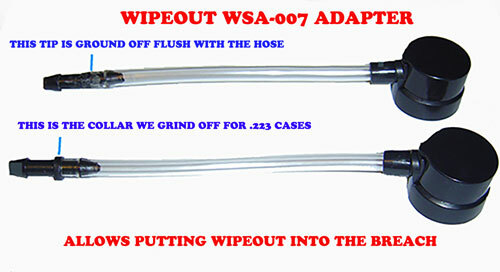 WIPE OUT revolutionized bore cleaning since it is still the only 100% brushless cleaner, which dissolves all fouling. It contains no acid, and no ammonia. Contains anti-corrosives that protect the bore without the use of oil. Therefore making fouling shots unnecessary. Color indicators show what is being dissolved. COPPER is blue. CARBON is brown. POWDER FOULING is always grey or black. Working time from 10 minutes to 72 hours. Many times with a heavily fouled barrel, copper blue will show as the first foam at the muzzle. ’PATCH OUT’ was developed for those shooters who were more comfortable with conventional application methods. Still has all the features of Wipe Out ,but is applied with a nylon brush. This makes ‘PATCH OUT’ foam like Wipe Out. We want bubbles of air like Wipe Out because they excite the chemicals making them 3 times more efficient than other cleaners. Convenient application is the key. ’TACTICAL ADVANTAGE’ developed solely for the Stoner designed family of M-16 ,M-4, and AR-15’s and all those clones of these firearms. These firearms by design are prone to huge amounts of fouling in the gas system, primarily the bolt carrier. The bolt carrier can become encrusted with fouling which prevents the intended function. ‘TACTICAL ADVANTAGE ‘ can clean the gas system and the bolt carrier, as well as functioning like Wipe Out, Patch Out. ‘ACCELERATOR’ developed as an adjunct for those shooters with COPPER problems. ‘ACCELERATOR’ is not a cleaner. It will when used with Wipe Out, Patch Out, or Tactical Advantage. dissolve twice the amount of COPPER, within any period. Use it when you don’t have time with a firearm you know has a history of COPPER fouling. DON’T USE IT IF YOU DON’T NEED IT. 1. TO RUN A “PROOF TEST” you put an application of either WIPE-OUT ™ or PATCH-OUT ™ in the barrel of the gun you wish to test. Let this application set in the barrel around 10 minutes. Push a single patch thru tho bore. If there is any fouling present in this barrel it will show up immediately on the patch. 10 minutes is long enough for the chemicals in our formula to react to any sort of fouling. 6.question: CAN I MAKE MY OWN HOSE ADAPTER FOR “WIPE-OUT” CAN ?? 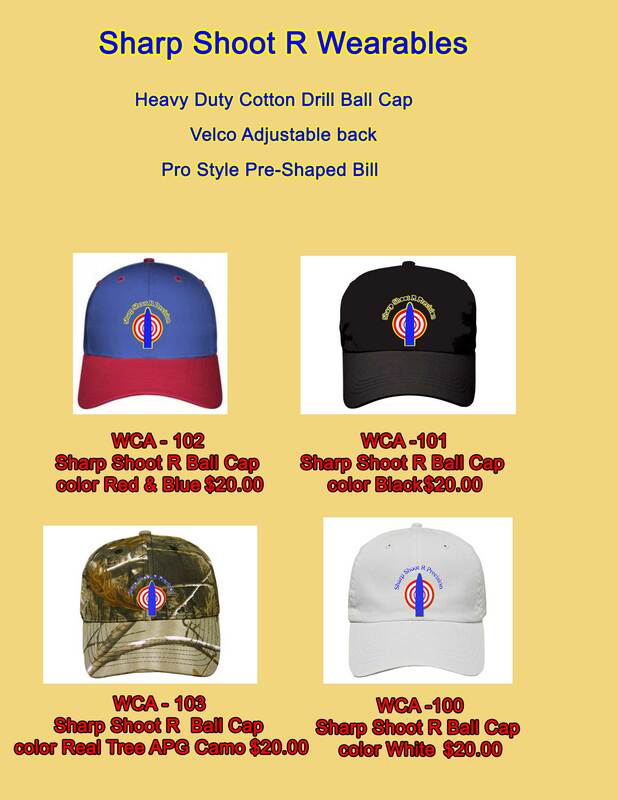 7. question: HOW CAN I MAKE THE WSA-007 ADAPTER WORK FOR SMALL CALIBERS i.e. .223 REM, .204 RUGER etc.